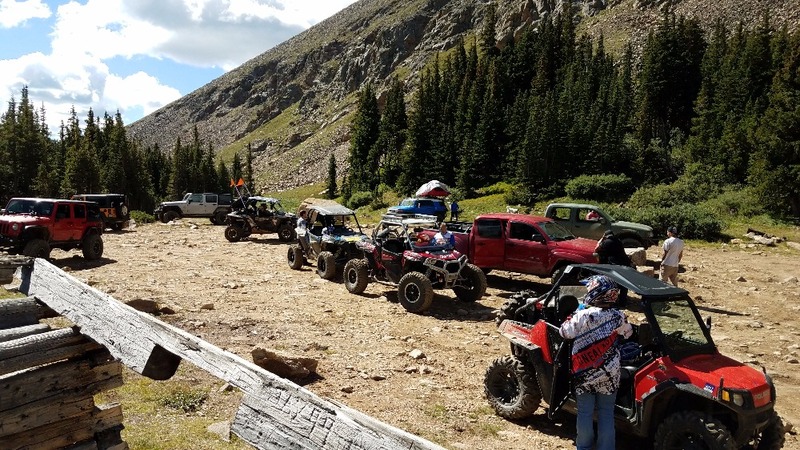 About 1 hour from Denver, Colorado and situated within the Arapahoe National Forest the Bill Moore Lake 4X4 Road is one of the trails in the Empire Loop, a network of trails just above Empire, Colorado. Offering amazing alpine scenery and fun hill climbs for both the novice and seasoned, this trail is a must do. 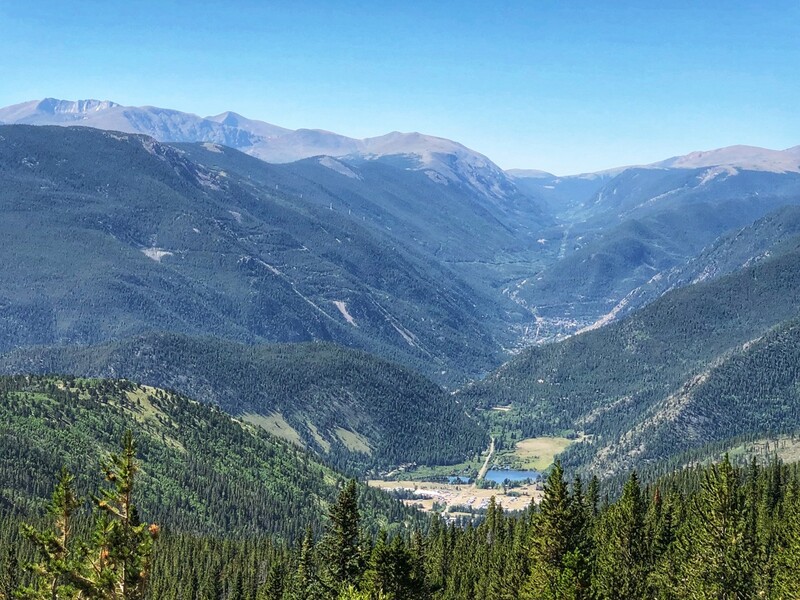 While you are at it, visit the Hard Rock Cafe in Empire, the original, dating from 1934, and named for the hard rock miners that were its early customers. It predates and is not affiliated with the chain of restaurants that also call themselves the Hard Rock Cafe. The Bill Moore Lake Trail is part of the Empire 4X4 Loop. 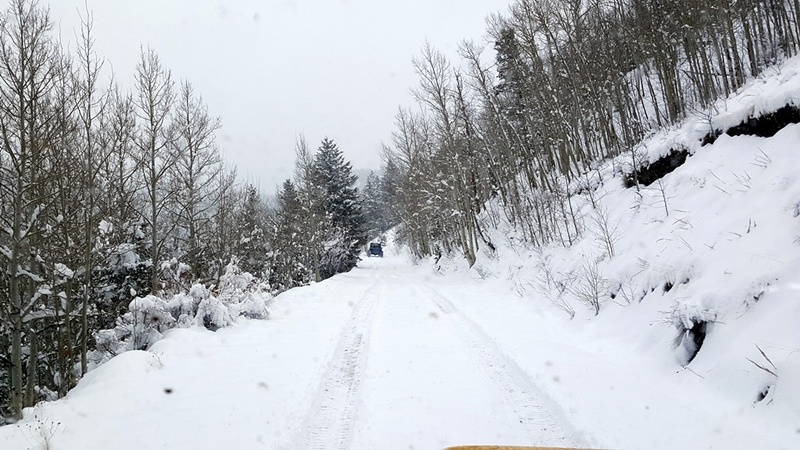 The road follows County Road 251 for the first few miles before it joins Forest Service Road 183.1. 95% of the trail has passing areas except at the very end when you climb down into Bill Moore Lake. It starts within a more wooded area along Country Road 251 which is filled with whoop-de-dos and washouts. Once you pass the Conqueror Mine it follows a shelf road before one last narrow switch back. It finally joins with Forest Service Road 183.1 where the forest thickens before it climbs to the fringes of timberline giving way to a general alpine and open space. Once in the alpine zone there are plenty of moderately steep climbs with loose rock. It connects with the Mill Creek and Red Elephant Hill Loop. 4 low and high clearance recommended. Turn right at the fence to head to the official trailhead. 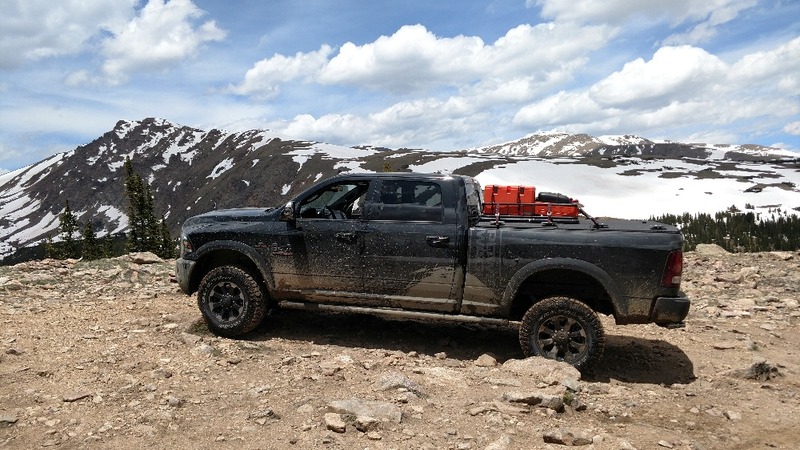 This is also a great location for airing down and disconnecting sway bars. The road will start climbing immediately. Continue on the main road as it climbs up this first switch back. Each year the make up of this section of the trail changes. 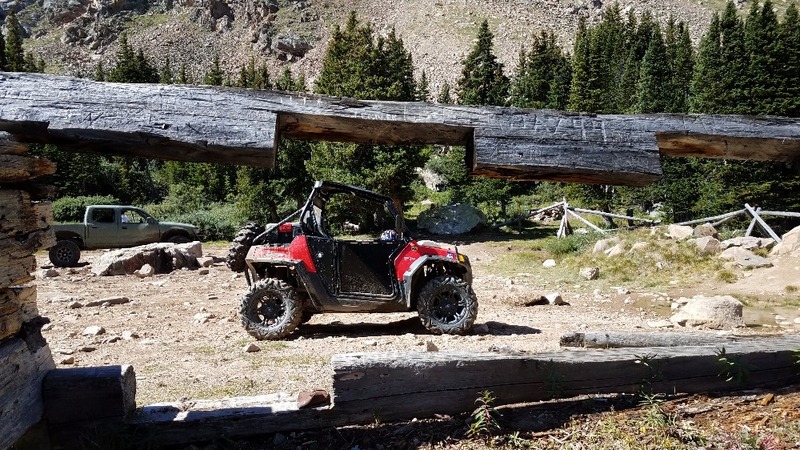 This is a fun section of the trail to test your vehicles ability to flex. Follow the switch back uphill, where you will navigate through more whoop-de-dos. Stay straight. Years past this was more whoop-de-do and less wash out. Today its more washout so just pick and plod your way through. Follow the switch back uphill. 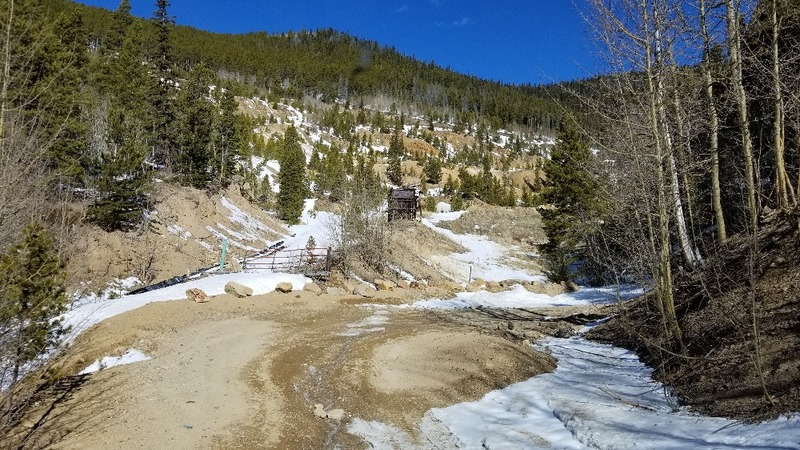 The Conqueror Mine was an active gold mine back in the mid to late 1800s; production from this mine helped establish the town of Empire. Optional: You can turn uphill here for a more challenging hill climb. It does get narrow with loose rock. If you choose this optional route, turn left at the top of the hill where it meets the main trail. Stay straight: Continue straight and follow the switch back uphill. Be sure to watch for oncoming vehicles just after the next switch back, there is little to no passing area until you reach the next waypoint. Stay right. The split ends at the same place. GPS mapping shows the lower road to be the official route. Stay straight. If you choose to come down this way, its a good idea to send a scout down and radio up as there is no passing. Follow the trail left uphill. Follow the trail left uphill. There are a few different lines to take on this uphill, with the right side being the more easy. Stay right for an easier route. Stay left for the more challenging and scenic route. The route to the left is steep with loose rock, it is a fun climb, but 4 low is recommended. Stay straight on the main road. You will have amazing views down below from this point and also get to see the hill climb you will partake in. 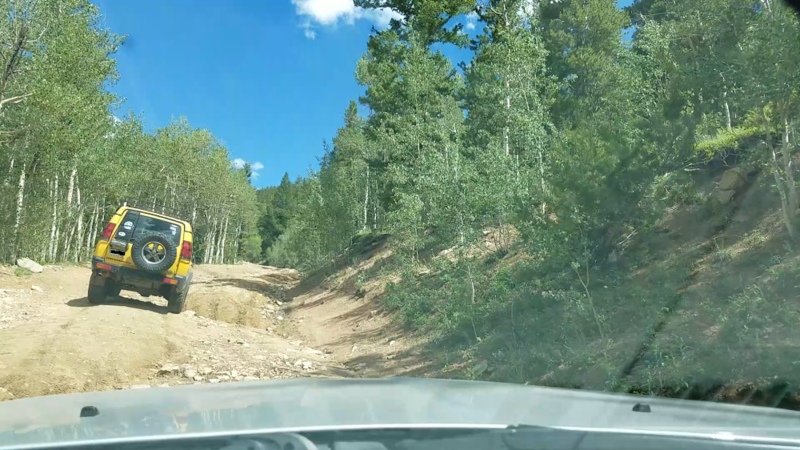 There are several pull outs, but keep an eye on newer drivers that may not know uphill has the right of way. 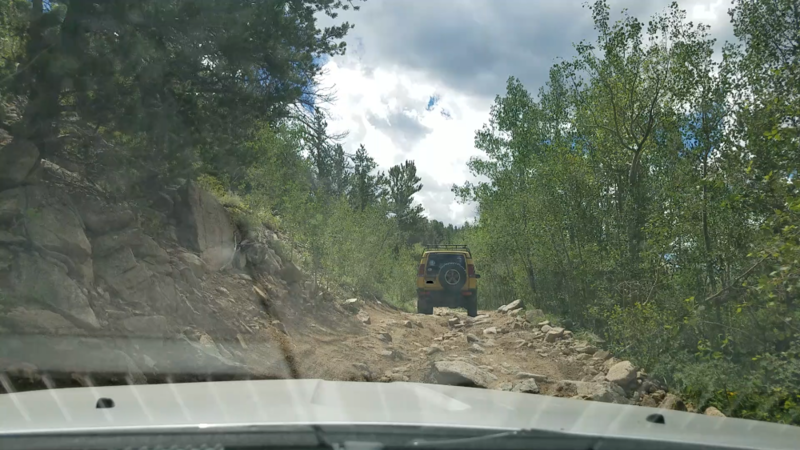 The trail generally gets more rough and challenging from this point forward. Stay left on 183.1. This road eventually dead ends with 1 or 2 dispersed camping locations and includes views to the eastern plains and Denver Metro off in the distance. Stay straight. Shortly after this area the trail will descend into the Bill Moore Lake area. It will get narrow and slightly more challenging with few passing spots. Take caution to mind oncoming uphill trail traffic which would have the right of way. End. There are a few dispersed camping spots which can fit vehicles. 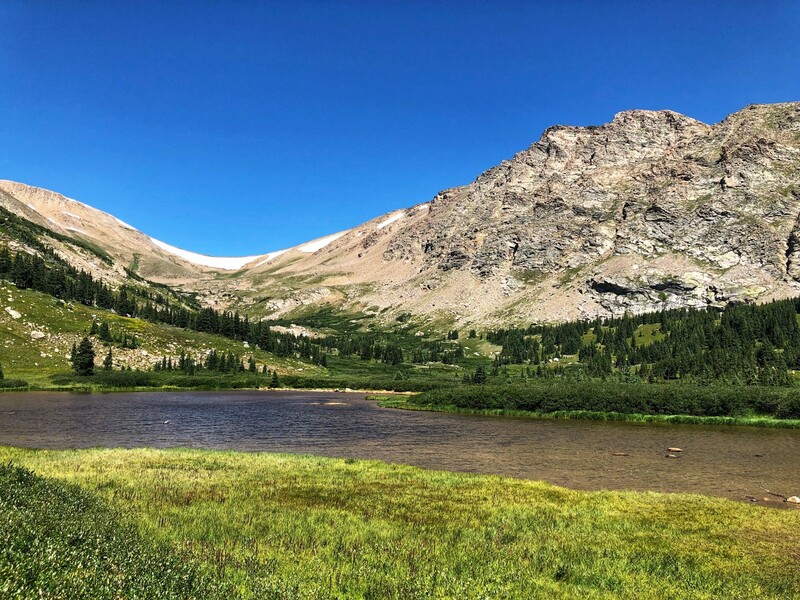 Surrounded on 3 sides by nearly sheer cliffs, the lake is framed by Breckenridge Peak to the southwest at 12,889 feet and Witter Peak to the north at 12,884 feet. There are remains of an old cabin within the parking area. Be courteous and leave everything cleaner than when you found it. Take I-70 west to Highway 40. Go north to the town of Empire. Turn right on Main (this intersection does not have a street light). Travel approximately 1 mile just after turning on Main to the air down area. There is dispersed camping along the trail after waypoint 10 along the trail. There is also one or two secluded areas at the end of 183.1C and a couple at Bill Moore Lake. A: It’s a pointless road, it just connects to the main road further up. Q: Has anyone stayed overnight here? Does it stay crowded or is it all day-trippers? 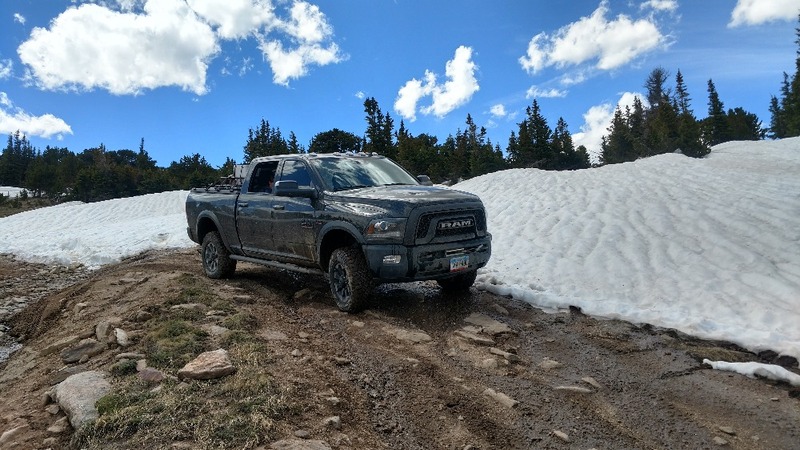 I'm just Trying to find a secluded, yet drivable dispersed camping spot close to Denver for a quick getaway in the Tundra. A: Yes, there are a few good spots by the lake, but also right around waypoint 12 or 13 there are a few good spots also. A: We camped here the weekend of Sept 9. Most people we ran into came for the journey, ate and then left. Pretty peaceful. 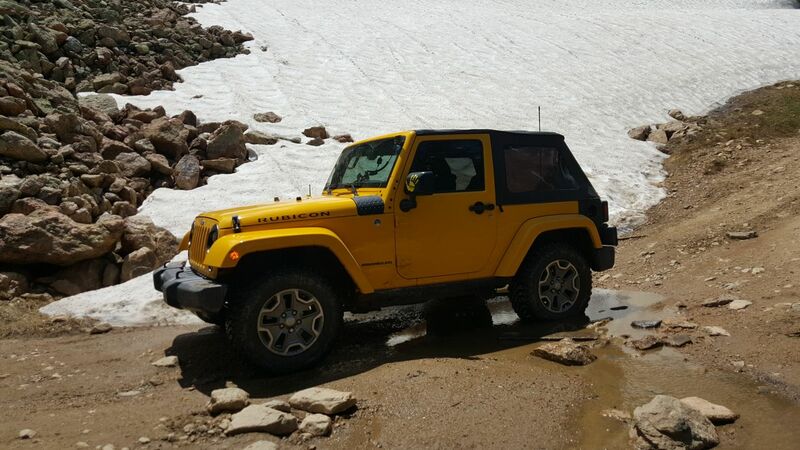 Q: For mid July, would a stock 2016 Wrangler Sport be capable? Thanks. 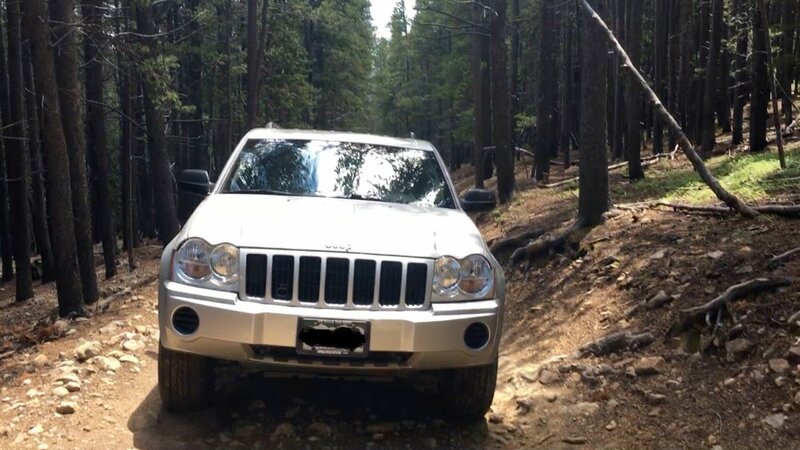 A: I noticed you asked the question for the mid-July month which is around now so here's my answer if this helps and isn't too late: I ran this trail last November with my stock Grand Cherokee and she only has about 8" of ground clearance. She came from the factory with no 4 low, no locking center diff, and open diffs front and rear. (Pretty much AWD). We still made it through the trail just fine. 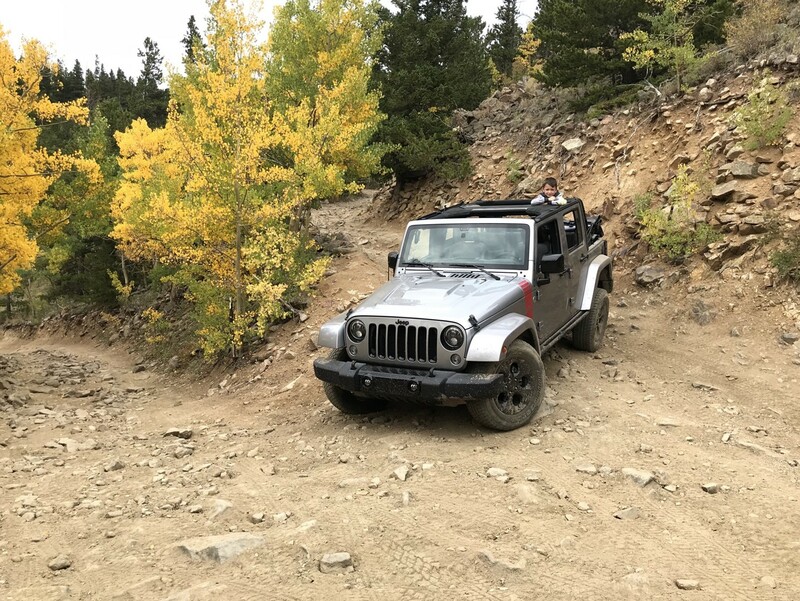 In fact, I'm actually headed back up with her tomorrow on this same trail coincidentally enough to show my friends that I really did take a stock soccer-mom AWD Jeep up this trail lol. Picking your lines is extremely important though on this trail. To answer your question, yes. 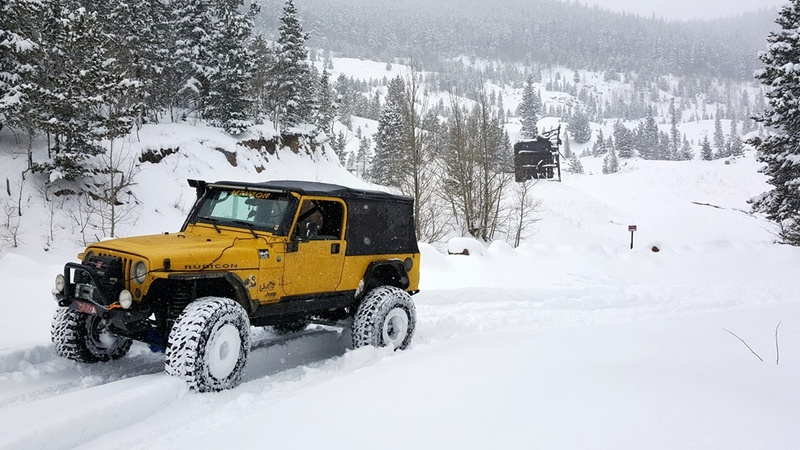 Your wrangler will be just fine with the right driver skill set :) Have fun and be safe! A: Todd, most likely. You will need to pick your lines in a few spots. The roughest part is just before the lake and we won't know what the conditions will be until the last drifts melt. Q: What would you say is the minimum ground clearance needed for this trail? Tried posting a review last night, but not sure it took so just making this gets out there. Just wanted to let people know that this trail is dry to the final hill that drops you down to the lake. That hill is snow covered, and can get icy would advise to not head down to the lake unless you've got chains to get back up that hill. Spent the day exploring the Empire trails starting with this one (the Bill Moore Lake trail) and had a thoroughly good time with the family. 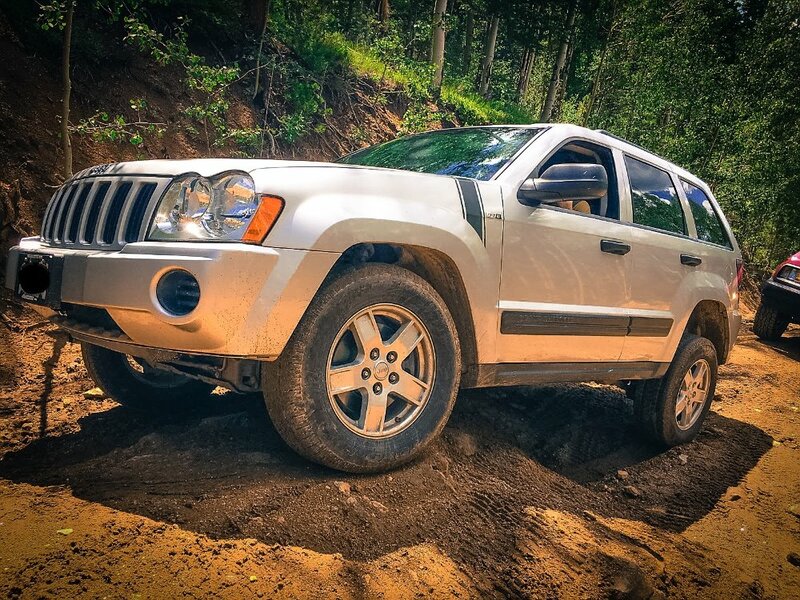 We run a stock 2015 Jeep Unlimited Altitude, and it handled the trail quite well. As others have stated, there are a few spots where you will need to pick your lines smartly, and a few spots with some decent washout...but nothing too extreme. There is a stunning vista view on the climb up (past the chutes, if I recall) and was a prime picture spot. My son said it was his favorite part of the trail. 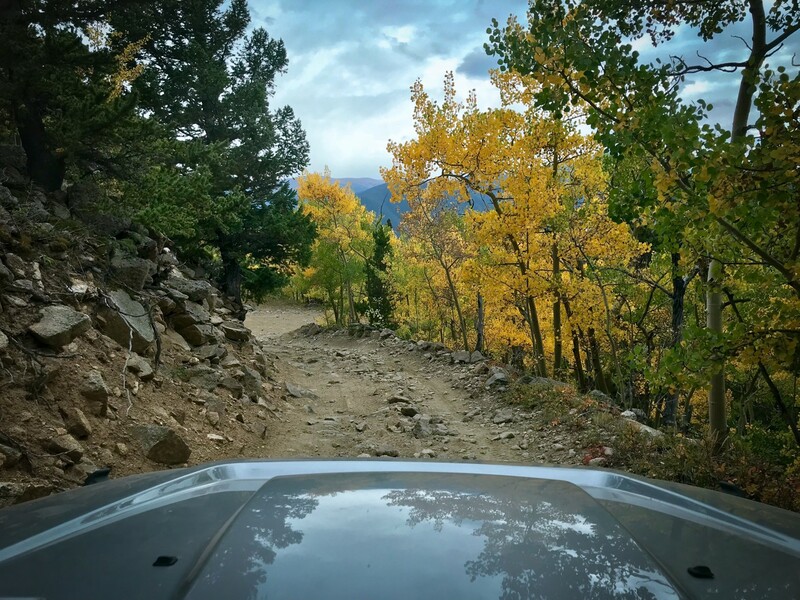 The aspens are just starting to take on their yellow hue. We will plan to go back in a few weeks to see more color. Great trail! This was a fun easy to moderate trail. No lockers needed and the deep dips are mostly avoidable. It's BML... so that means great views, a pretty lake at the end, and a bumpy road. Conditions were dusty, as is typical this time of year. There were about 6-8 other rigs along the way, which is also typical as this area is popular. Be prepared that some folks don't know or care to follow right-of-way rules on hills, and some of the hills on this trail are not conductive to stopping if you're the uphill vehicle as the surface is loose and rocky. If you have an opportunity to kindly educate, it may go a long way. Ran the trail as part of All-4-Fun in Empire. The guide was spot on, awesome views of the event in Empire and a great day on the trail. It was open completely. Dry and rocky with mild water crossings just before you get to the lake. i feel the road has deteriorated a little since last year. 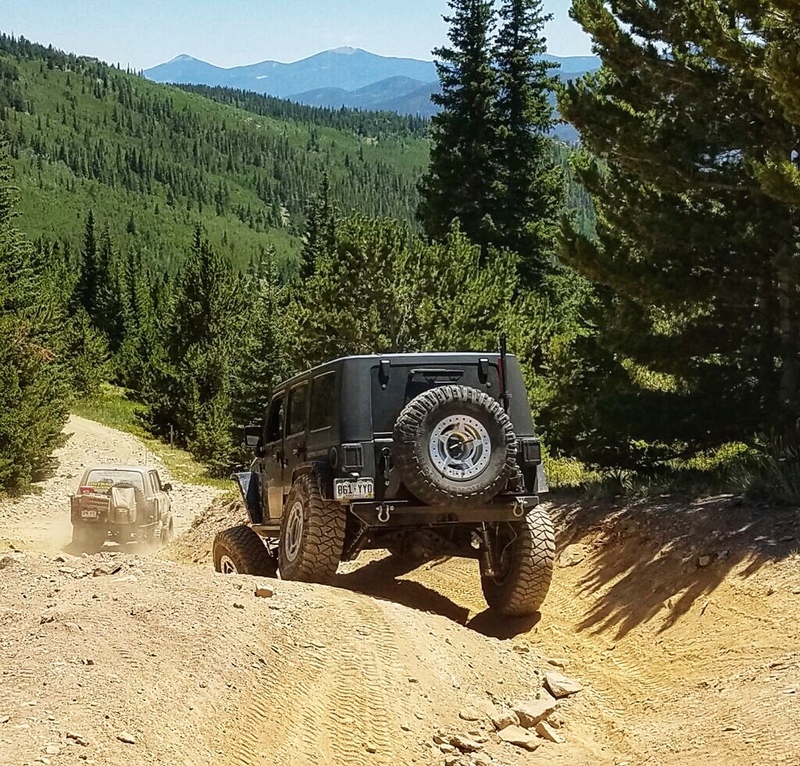 This is one of the best offroad trails near Denver. It usually is open to the lake starting in early to mid July. Trail is still partially closed. The trail is mostly dry with some snowy spots until way point 14. The road becomes impassable due to very deep snow drifts. I was really wanting to do some fly fishing too. 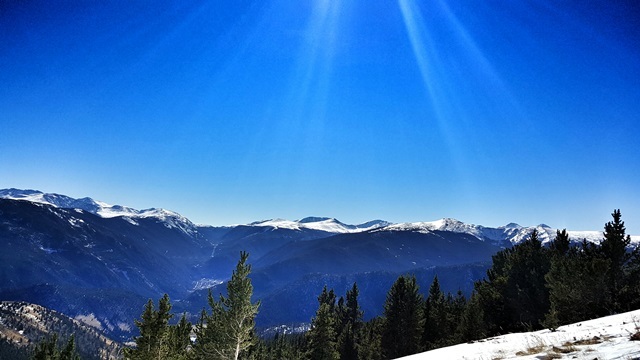 Headed up the trail on March 18th before the most recent winter storm rolled through. The day started really nice and sunny with warm temps. There was practically no snow until you got to the mine at waypoint 5. When we got to the chutes, there wasn't much snow at the bottom, but there was a thick layer of ice. When you get to the turn in the chute, that is where the snow was drifted pretty deep. The snow was a very soft, light, and icy snow that didn't compact at all. Once you broke the crust, you sunk to the bottom and then hit solid ice before the dirt so there was no traction. We had to winch the corner but we're able to drive the rest of the way. Above the chute the trail is covered in nothing but deep snow. We only made it 1.6 miles which isn't even to the split with Miller Creek. This was before the storm that rolled in, so it's going to be quite awhile before the trail is even doable beyond the Chutes. 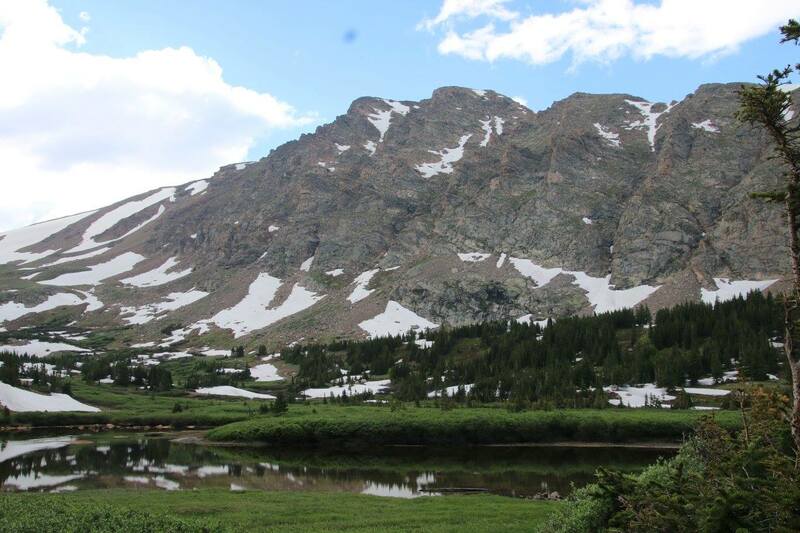 Snow has fallen in the high country making this trail impassable. 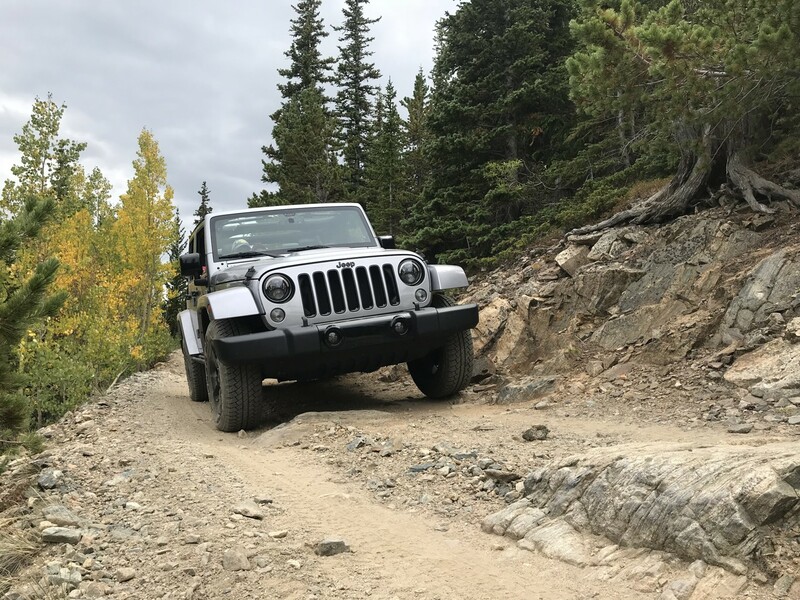 We did Bill Moore Lake Trail over the Sept 9th & 10th weekend. I found people listing it as a 3/4 or 5/6 rating. Depending on what you're driving, they are correct. 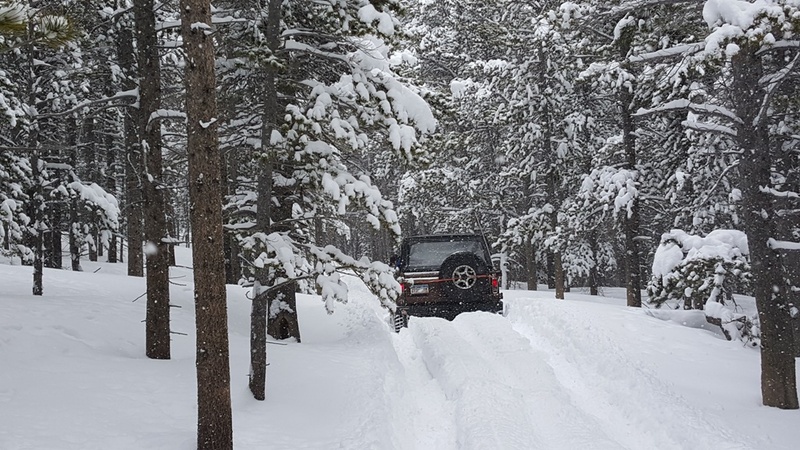 4wd is definitely needed with (my opinion) at least 9" of clearance. 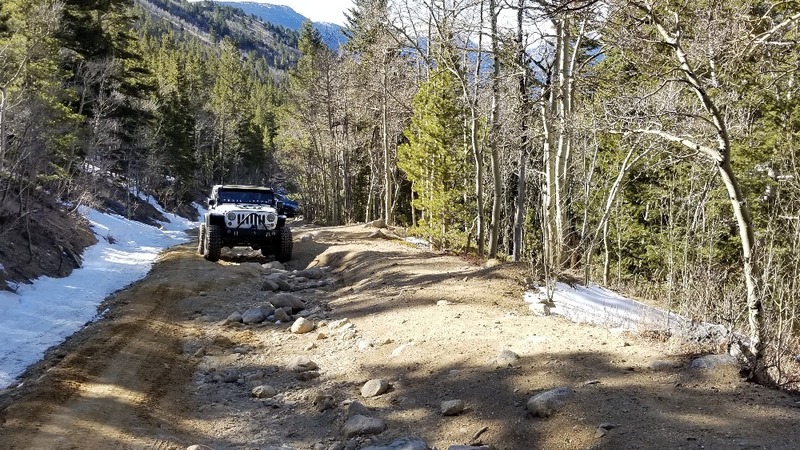 It's a fun trail with tight switchbacks, big, loose rocks. Some spots need a locker but there is a designated bypass as well. 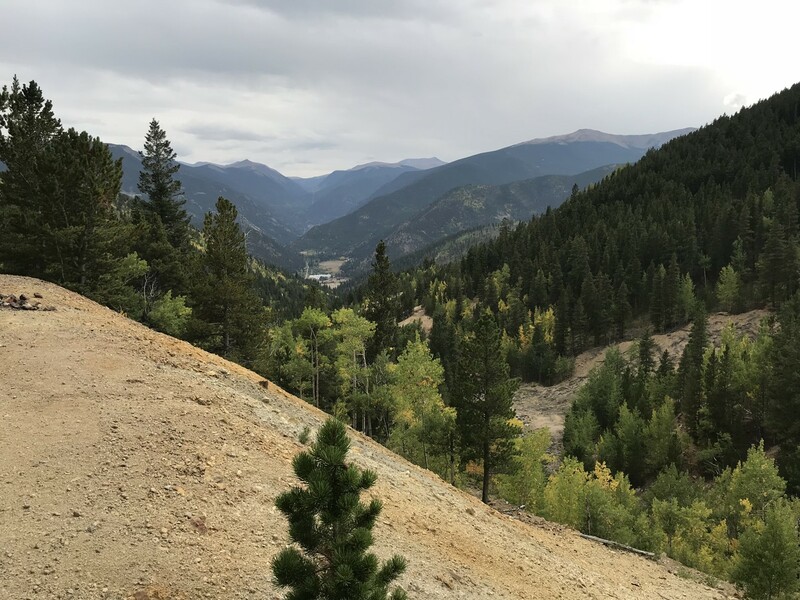 The views are amazing, most of the trail there is plenty of room to pass. The decent to the lake is the only place where passing may be difficult or not possible. 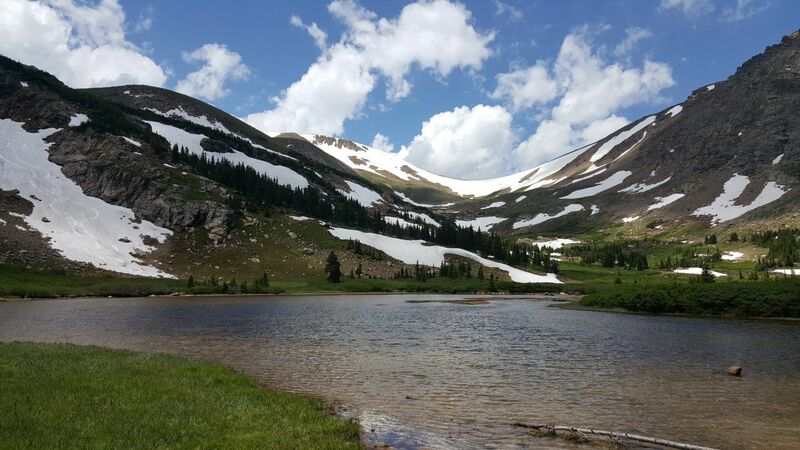 Campsites are beautiful as you are surrounded by towering mountain views. Took the SxS up Bill Moore and Mill Creek. The parking area was FULL at 8:30 am. Loads of ATV and SxS trailers. Surprisingly we didn't see many folks on the trails. When we first pulled up to the lake, there were only two trucks there. When we left the lake 20 minutes later, different story. (See pic.) The trail conditions were PERFECT!! Not muddy, but just wet enough to keep the dust down and provide a few splashes in the low spots. Drove Bill Moore Lake along with Red Elephant Hill and Mill Creek as part of a full-day loop. 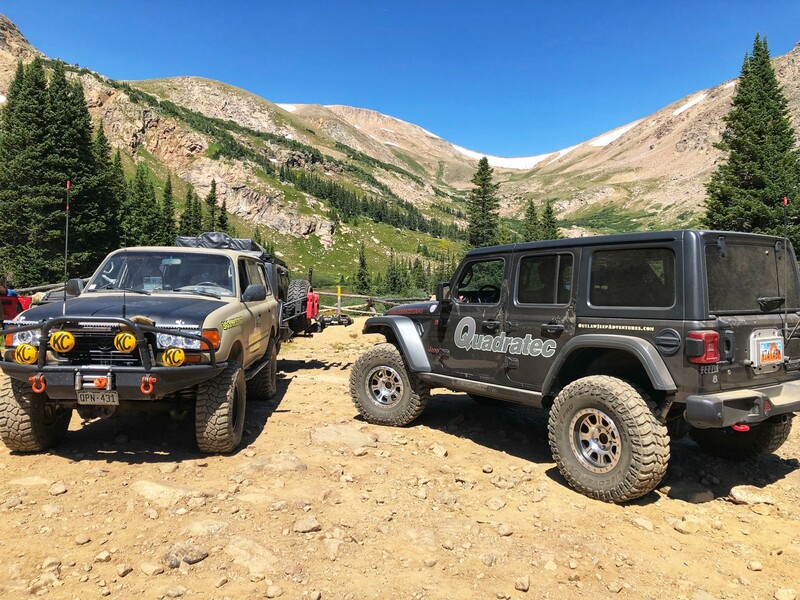 Our group was the trailsoffroad.com Meetup group from Denver. Wider and more open than either Red Elephant Hill or Mill Creek, Bill Moore Lake was the most pleasurable segment of the trek. 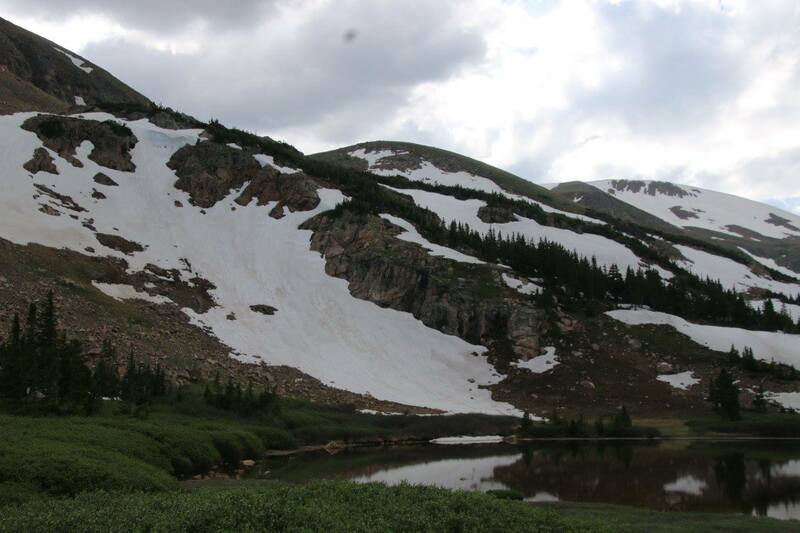 There is still snow at the highest elevations, but none obstructing the road. Arriving at the lake was the highlight of the day. I try to run a trail every 4th of July. 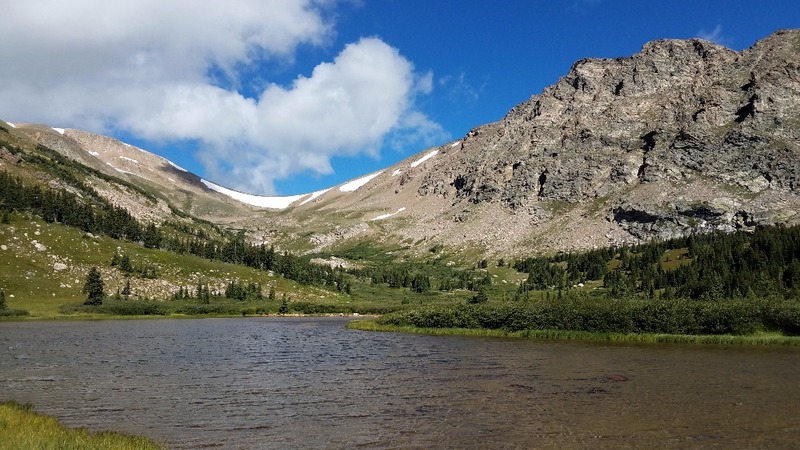 This year the choice was to run Red Elephant to Bill Moore Lake, then Miller Creek and exit via Bill Moore. We arrived on the trail at about 11:15 PM the sun was shining and the trail was dusty. Red Elephant proved to be a little challenging. I had to use my rear locker multiple times, and had a few very close calls. 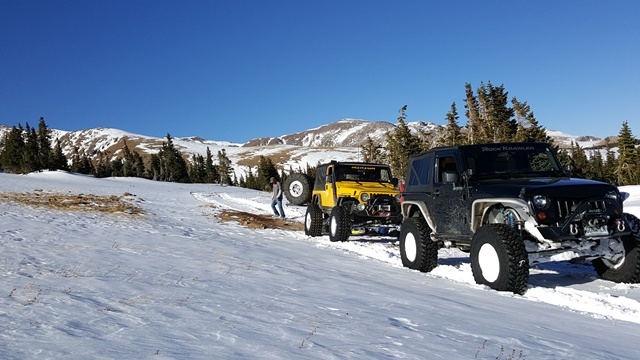 We made our way up to the lake where there were about 5 other rigs up there. Talked to a few people, ate lunch with our feet in the lake and then headed down to run Miller Creek. This trail was fun, not as challenging as Red Elephant, but overall it seemed to be more narrow than the other trails. Came out the lower end and wrapped back to Bill Moore Lake trail and went down the chutes. Ended the day after airing up at just after 3:30 PM. Made it home in time to catch a concert followed by fireworks. Beautiful day! 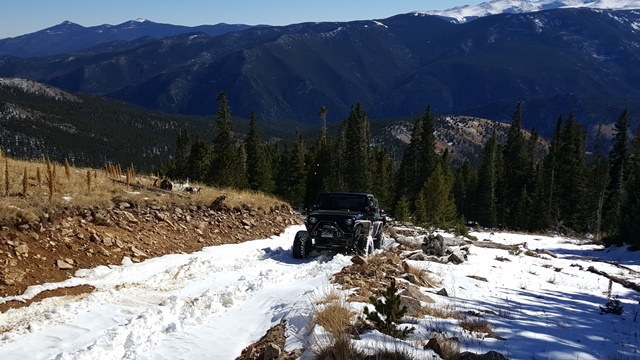 We took our SxS up to check the snow. 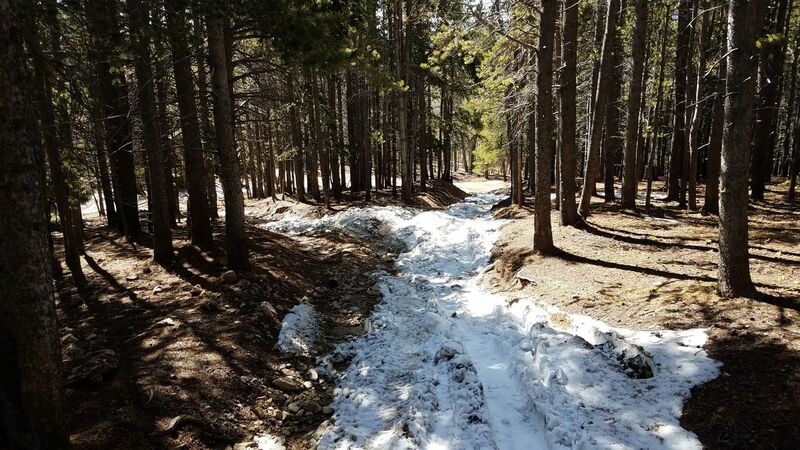 At the switch back just past waypoint 11, snow blocks the trail. Beautiful weekend of camping off the trail of Bill Moore Lake to view the Perseid Meteor Shower Aug 12th and 13th. The temps Friday night dipped into freezing and left a layer of ice on the dog dish. Better temps on Saturday night. Went up to Bill Moore for the first time on the 4th, traffic was surprisingly light. 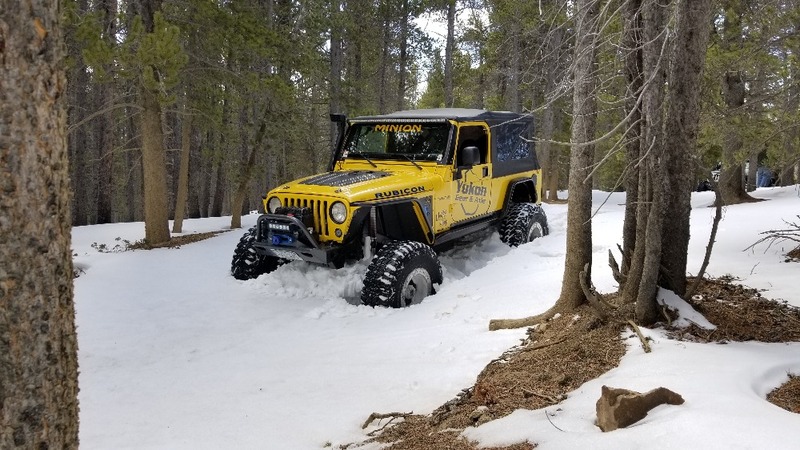 We took the stock Rubicon so we took all of the 'easy' bypasses to get to through the trail. The trail is open all the way to the lake with only a few bits of snow. One of them pictured here, both cut/plowed out. The larger of these two snow melts has caused a little mud and rutting to occur near the tree there. Be careful on that line and be aware of momentum. I was mildly concerned that I hadn't turned on my lockers when we came across this little obstacle. The lake is in melt and standing water, soooo, mosquitoes! Bring the Deet and put it on before you reach the end of the trail to spare your bloodstream. Most of the trail to Bill Moore is in its near summer time condition. 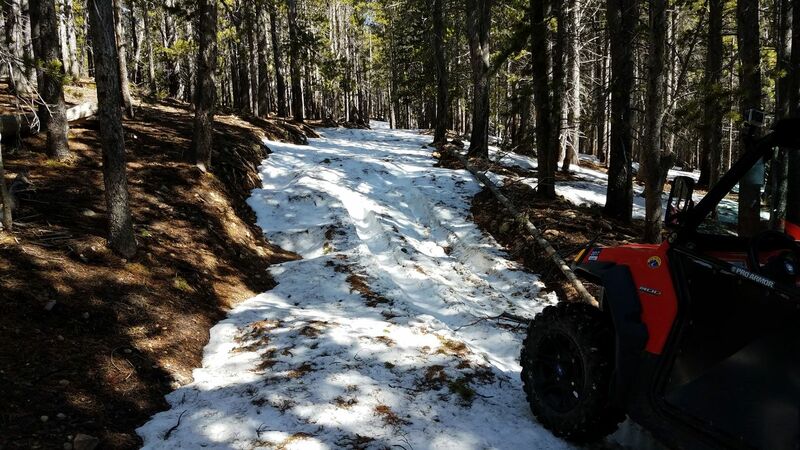 There were a few small snow drifts that were less than 6" deep left and some parts of the trail were wet from snow melt. 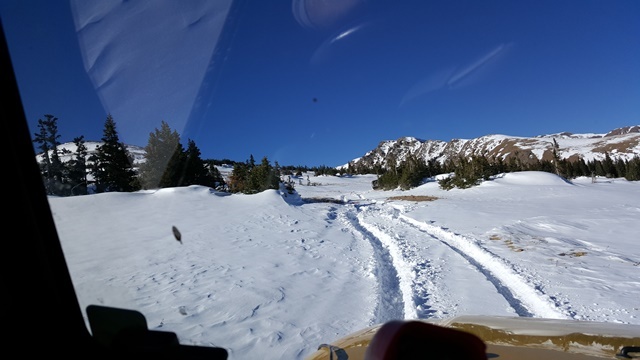 Earlier in the day we met with a Forest Service Ranger who had told us that someone had winched through some of the snow drifts that were on the downhill road into the lake, so we investigated after running Miller Creek. 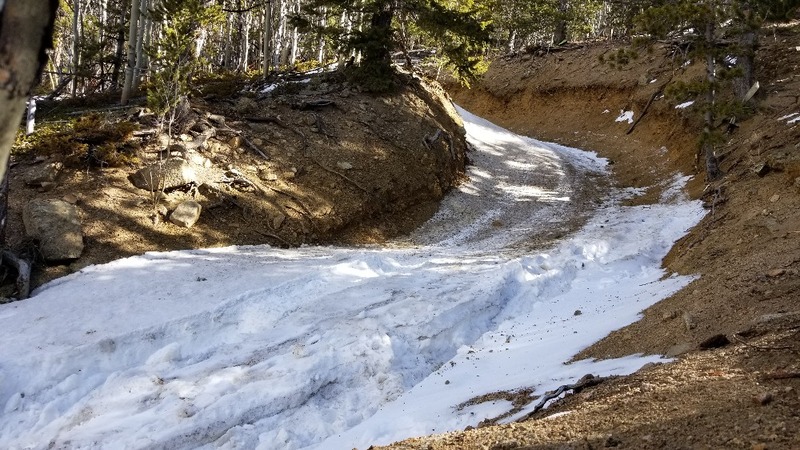 As the ranger had stated the snow drifts had been opened up and with the warm temperature there was almost no snow left on the trail. At the bottom near the Buck Fence a large 3+ foot snow drift was still present along with a good amount of water. We shoveled for about 20 minutes and were easily able to get past the drift. 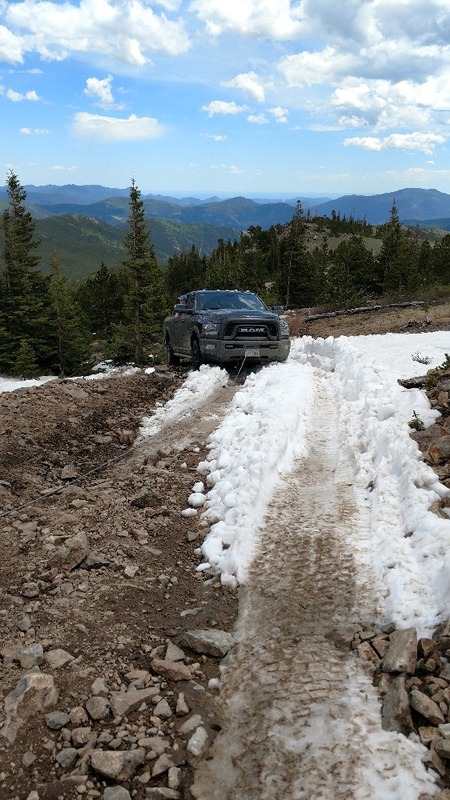 Note: that there is quite a bit of water from melting snow so be cautious not to dig any ruts. We monitored it closely. We were able to make it all the way to the lake. With the warmer temperatures the remaining snow drift should melt quickly. Snow is blocking the trail just past waypoint 15. It was the last day of April and we were on the hunt for some semi open terrain. What we found, was extremely deep, rig swallowing snow. I was in the LJ on 37s, the CJ was on 42s, and the Bronco was on 35s with tire chains. All three rigs are locked front and rear and have winches. Several fresh inches of snow had fallen the night before and we were making the only tracks from the parking area up the trail. With only several inches under our tires, we made good progress up till the chutes at waypoint 7. 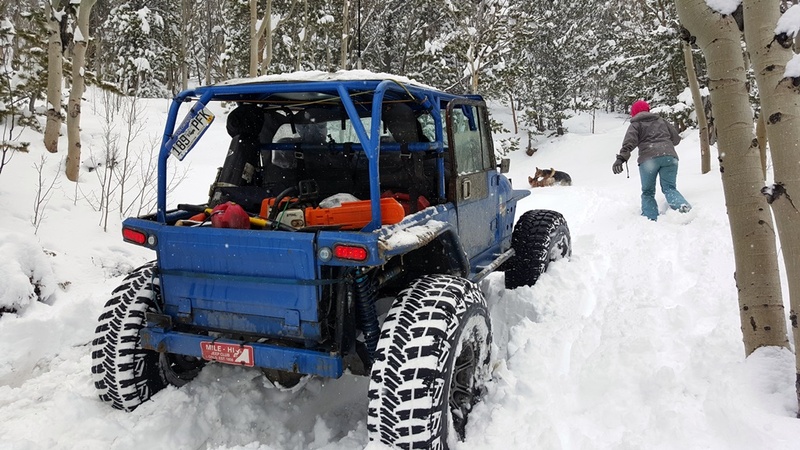 The CJ went first and only made it 30 yards before progress stopped and the uphill climb was nothing but an ice sheet under the fresh snow. As he attempted to power through the chute with his big V8, Ryan decided to check out the main route to the right of the chutes. 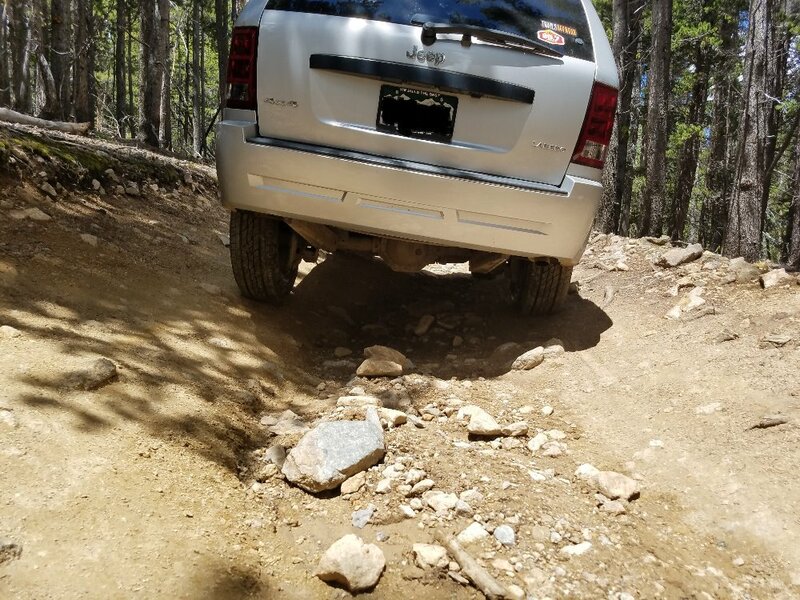 Quickly it became apparent that direction was not a possibility as I was greeted with some extremely off camber drifts towards the downhill side of the trail. 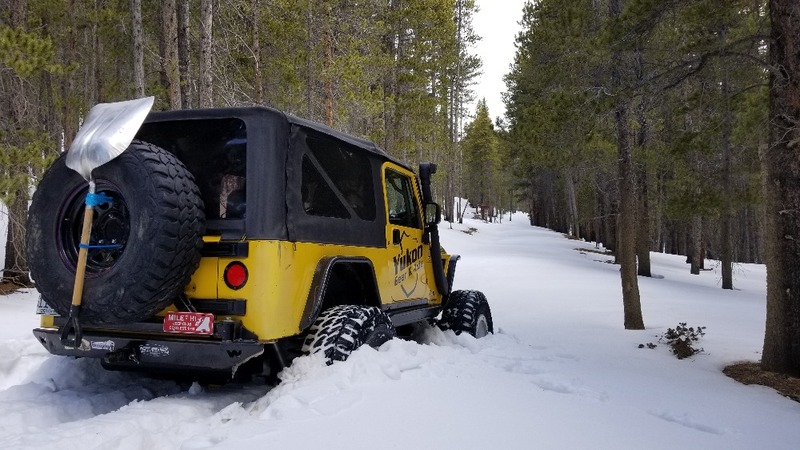 While attempting to backup, the LJ slide sideways and dropped a tire of the trail. Out came the winch for a quick self correction to pull it back on the trail, and back to the chutes I went. 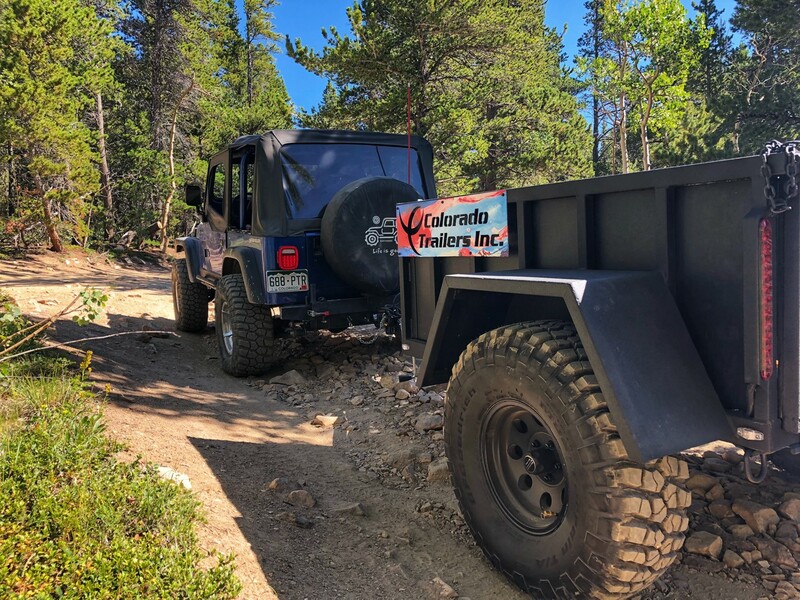 The CJ had made it up to the left hand turn in the chutes, but had decided it was more productive to use the winch now instead of trying to throttle out. 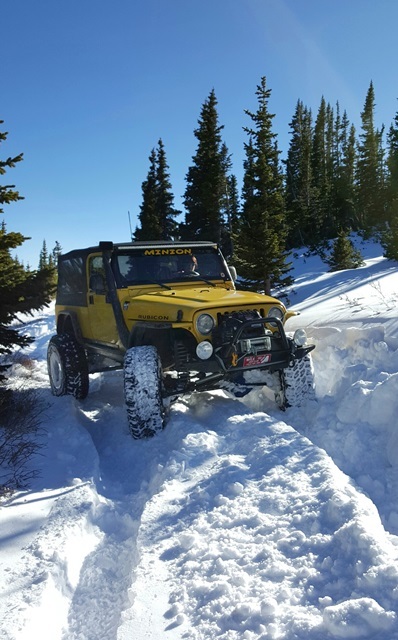 Once past the turn, he was able to get enough traction again to continue without the winch. 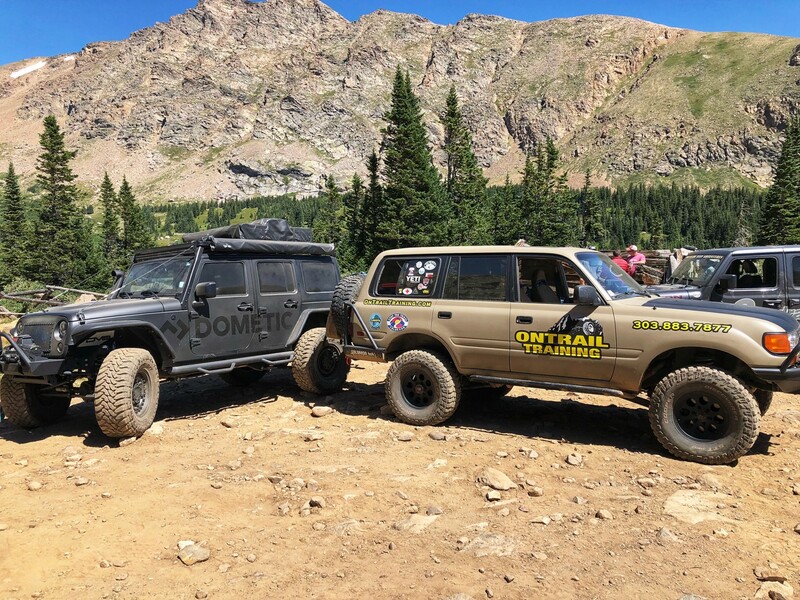 As for the Bronco and I, we also had to winch at the same turn spot. Once we were out of the chute and met back up with the main trail at waypoint 9, the snow became pretty daunting. 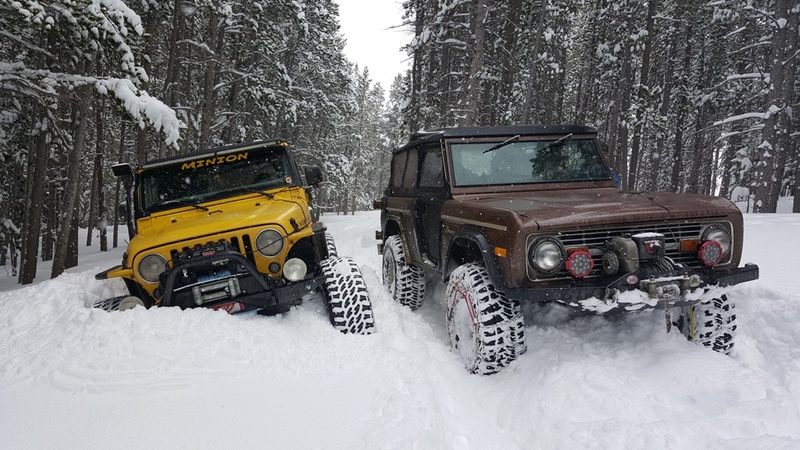 The CJ plowed the way while the Bronco had to winch a couple times. 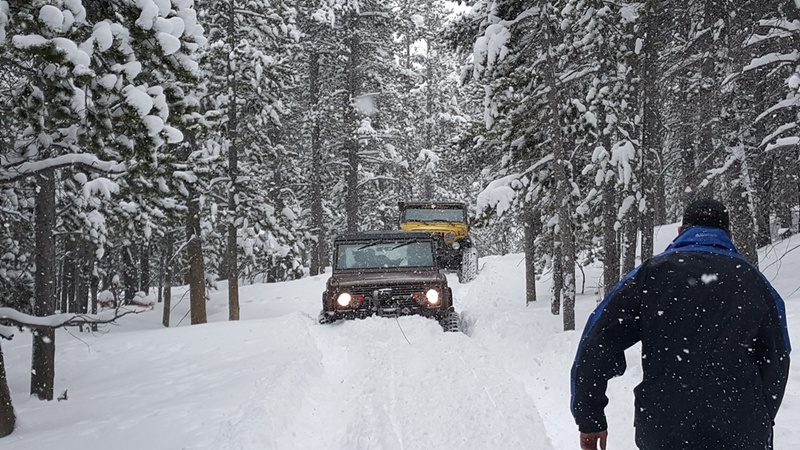 We reached waypoint 10 at the split for Miller Creek, and found the snow completely impassable to continue. This was the ample opportunity to turn around. Ahead of us, the snow had to have been 7 feet deep with extreme camber into the trees. We turned around and made our way back down the trail to check out some other nearby routes. The trail received several inches of fresh snow just while we were on it. 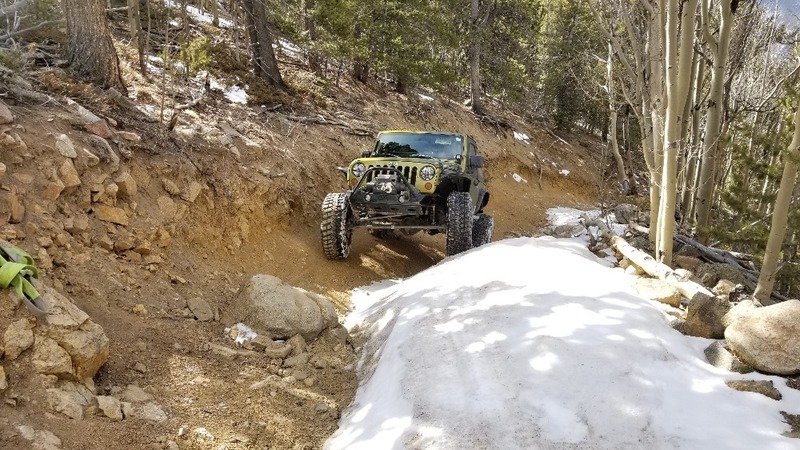 With the amount of snow we saw, I wouldn't be surprised if the trail is only passable this far till at least the end of May. It was the 8th of November and I ran up to Bill Moore Lake with another buddy. 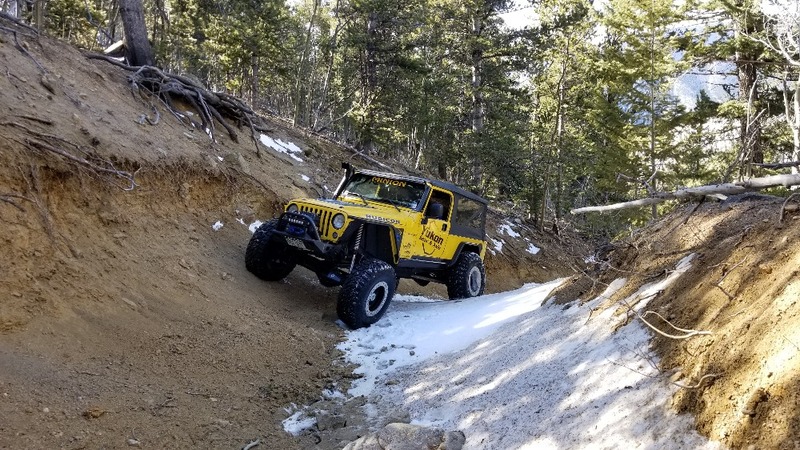 I was in my LJ that is locked front and rear, on 37'' tires. 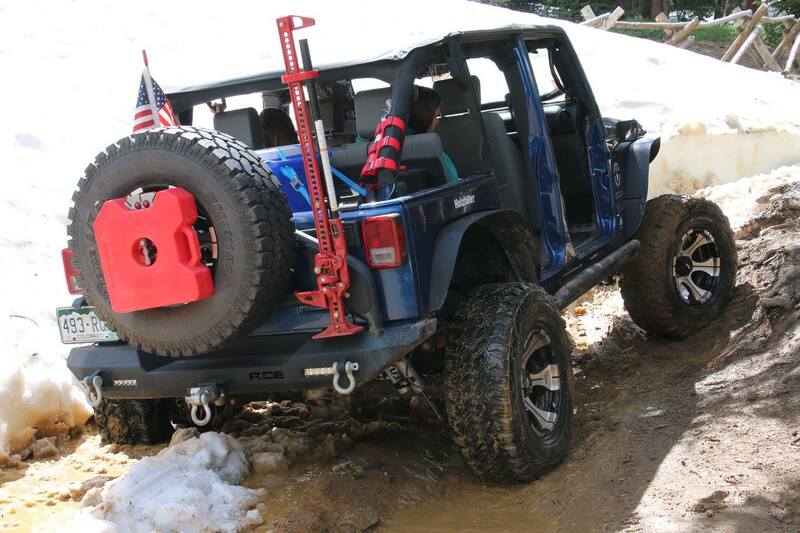 My buddy was in a 2dr JK on 37s with only a rear locker. We started the trail around noon and it was a gorgeous day. Close to 60 degrees all day, and no wind to speak of, even at the top. We didn't encounter any snow till about waypoint 7, and even at that point it was just an inch or so and very spotty. The trail was fairly clear and easy till we got above tree line. Once above tree line the snow got several feet deep in some place. 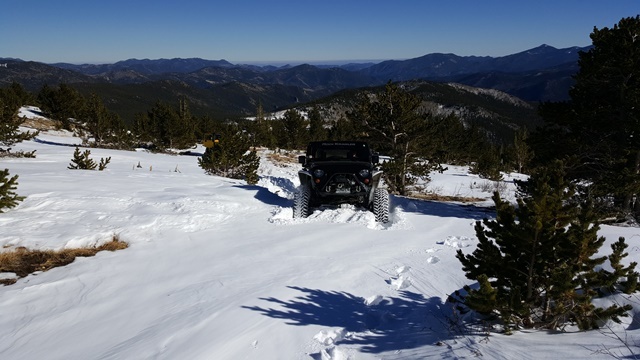 It was a struggle to get to waypoint 15, but we did it without winching, just a lot of back and forth snow busting. 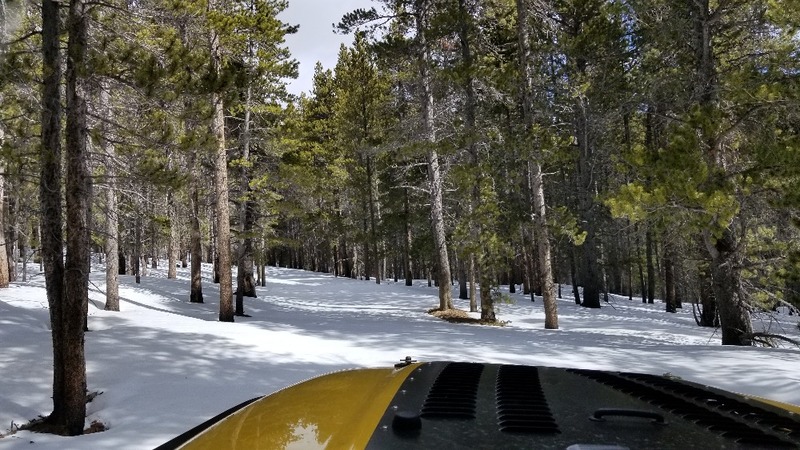 We were able to continue through about 8'' or so of snow past waypoint 16 just before the trail drops back down into the trees and has a couple steep downhill sections. The snow was easily 2 feet deep at that point and even if we made it down the hill, coming back up would have proved very very difficult. We opted to turn around at this point. This was 4.8 miles into the trail. Overall, super fun day and I was actually surprised how far we were able to make it considering the snow we have had lately. Won't be open this far for too much longer as another storm is coming in on Wednesday.